Front row from left: Tara Conley, Reagan Lawson, Lehar Chawla, Alden Kramer, Hope Carr, Kate Calderas and Shanai Auguis; back row, Sam Eidt, Kaila Gonzelez Reyes, Carly Hodes, Bianca Brock, Olivia Eidt, Katie Moore, Nicole Lawson, Alex Megarit, Casey Conley and Sherrie, Conley. Not pictured: Chloe Bryan. AYSO Team Beach, coached by Sherrie Conley and Sam Eidt, beat Laguna Hills 4-2 on Sunday, Nov. 9, capping a second undefeated season in league play. Ranked among the top teams from Irvine to San Clemente, Laguna’s record of 6-0-1 in the medal round and 9-0-2 overall, left them in sole possession of first place. Eleven of the 15 players scored goals this season in a true team effort. Alden Kramer, Chloe Bryan and Carly Hodes provided consistent scoring throughout. Supporting the attack Kaila Gonzalez Reyes , Bianca Brock, Tara Conley, Katie Moore, Alex Megarit and Hope Carr fed the ball to the forwards keeping the pressure on. 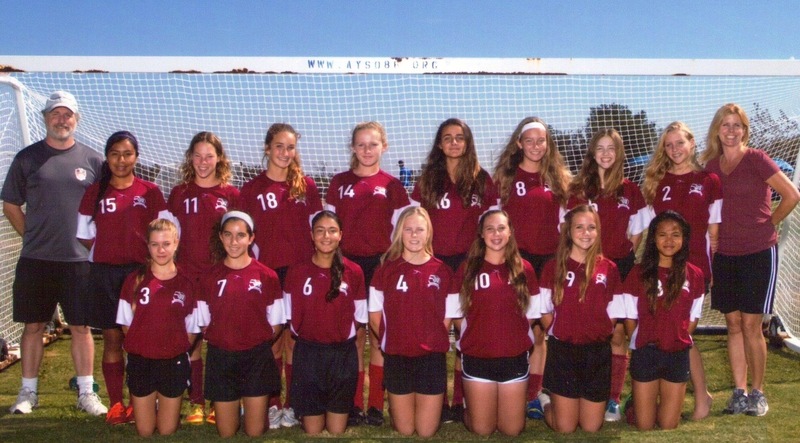 Olivia Eidt, Shanai Auguis, cousins Casey Conley and Kate Calderas, Reagan Lawson and Lehar Chawla allowed the fewest goals of any team through the whole season. Beach advances to the Section Championship at Chapman Garden Grove, where teams from Los Angeles, Riverside, San Bernardino , Orange and San Diego county will meet to determine the top team in Southern California.